These standards are commonly referenced in equipment specifications, and most of them only cause confusion. The first thing to note is that each of these standards is either a test method or specification. Test methods define a procedure for measuring a physical property associated with a material. These procedures are often material specific. Specifications (often simply entitled “Standard”) generally reference several acceptable test methods and set maximum or minimum limitations on the result of a test for compliance. In order to determine compliance with a specification requirement, it is important to note whether the referenced standard is an actual specification or just a method of test. Since there is no way to comply with a test standard, the inclusion of test standards in a specification often causes confusion for vendors. Another common problem involves specification that describe a specific lining material, but reference standards that do not apply to that specific material. All of these issues can be identified and clarified by simply knowing the full titles of the referenced standards. In addition to the aforementioned ASTM, NFPA and UL standards, there are additional industry standards published by the Air-Conditioning, Heating and Refrigeration Institute (AHRI), American Society of Heating, Refrigerating and Air-Conditioning Engineers (ASHRAE), and U.S. Green Building Council (USGBC). Traditionally, ASHRAE publishes test standards for equipment and guidelines for environmental conditions such as ventilation, indoor-air quality and thermal comfort. AHRI concentrates mainly on equipment ratings and performance certification. USGBC publishes the Leadership in Energy and Environmental Design (LEED) standard. Since most new construction projects will be designed with a goal toward achieving LEED certification, it is important to know what the USGBC requirements are for ductwork and equipment linings. According to the latest LEED 2009 standard, in order to achieve Indoor Environmental Quality (IEQ) Prerequisite 1, the building design must meet the minimum requirements of Sections 4 through 7 of ASHRAE Standard 62.1-2007 Ventilation for Acceptable Indoor-Air Quality. Under Section 5 ‘Systems and Equipment,’ it states that all airstream surfaces (with the exception of sheet metal surfaces and metal fasteners) shall be determined to be resistant to mold growth in accordance with a standardized test method such as those found in UL 181 or ASTM C1338. 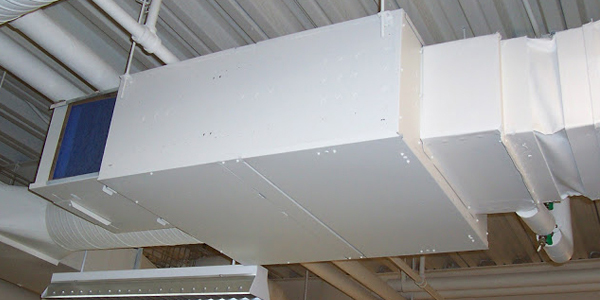 In addition, all airstream surfaces (with the exception of sheet metal surfaces and metal fasteners) shall be determined to be resistant to air erosion in accordance with the test method described in UL 181. In other words, any lining material that can meet the requirements of UL 181 is acceptable for use in any LEED-certified building. Here are some typical questions about liner specifications and standards: Does that mean I can put exposed dual-density fiberglass in a LEED Platinum building? Yes, it does. However, it may not be the best choice. Many engineers are looking for alternatives to fiberglass because no one knows how that material may be treated in the future. Today, there are innovative new lining materials that can provide improved indoor-air quality with little if any increase in cost. What kind of ‘new liners’ are you talking about? Titus has seized the initiative to eliminate fiberglass from many of our product lines. We currently offer our latest EcoShield liner in ½” or 1”-thickness with cloth-facing for the same price as fiberglass. This material is made from pre-consumer recycled natural cotton fibers chemically-treated to be fire-retardant and anti-microbial. The same material is also available with a scrim-reinforced foil-facing for critical environmental applications for a modest up-charge. We also offer our FibreFree liner in 3/8” or 1”-thickness. This material is called engineered polymer foam insulation (EPFI). It contains an anti-microbial agent throughout to fight mold growth and cannot absorb any moisture, making it ideal for humid climates and applications wherein moisture can cause problems. I submitted EcoShield on a project recently, but was rejected by the engineer because I could not prove that this material meets ASTM C1071. Why does EcoShield not meet ASTM C1071? EcoShield technically cannot meet ASTM C1071 because that standard only applies to fiberglass products. That does not mean that EcoShield is not suitable as a duct-lining material, because it may actually outperform fiberglass in the same tests. The engineer’s standard specification probably only takes into account fiberglass products and does not address the new liners available today. We suggest providing EcoShield submittal sheets, explaining the advantages and encouraging him to update his standard specification to include newer materials. So long as the lining materials meet UL 181, they should be acceptable. With a better understanding of the industry standards, it should be easier to promote new and better lining materials to the engineering community. Please direct questions toward Titus Communications (communications@titus-hvac.com) and/or Titus' Chief Engineer Randy Zimmerman (rzimmerman@titus-hvac.com).